Mali Mish – Until next time, Bisbee. Yesterday was awesome but today was awesomer. I know, i know. It’s not a real word… but today is my birthday so its my rules. All. Day. Long. We woke up bright and early because it was time to say good-bye to the always fabulous Shady Dell. And if you wake up early on your birthday, you get more birthday! And breakfast too. 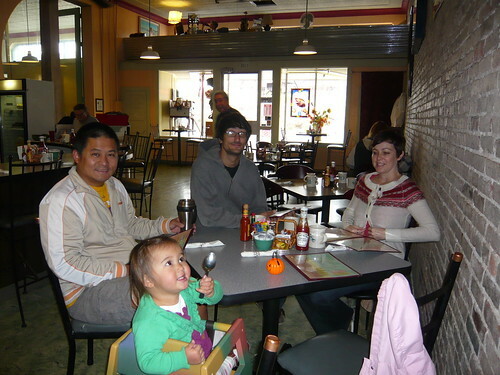 The Bisbee Breakfast Club was just a hop, skip and jump away from The Shady Dell. Which we of course discovered on our last day there. Why does that always happen? Why can’t we discover local favorites on the first day? 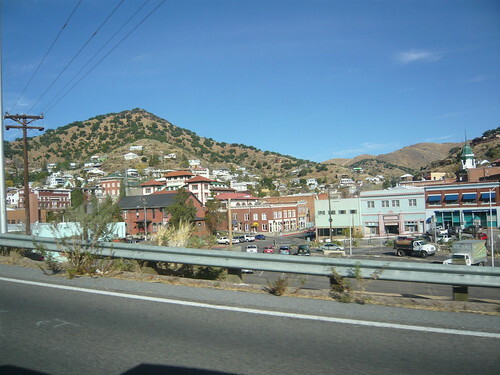 Good-bye Bisbee. You are a sweet little town. 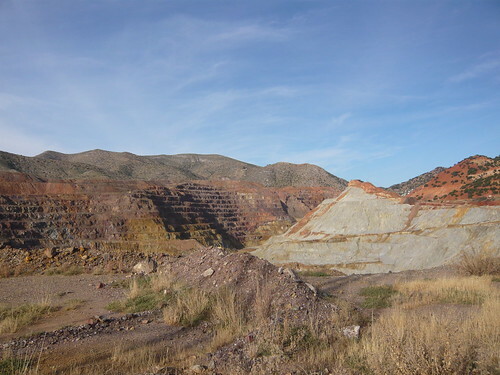 Good-bye Bisbee Mine. Your copper hillsides reminds of lucky pennies even though you kind of scare me. Today was mostly a driving day since our trip is quickly approaching its end. We have set our daily max to around 200 miles when driving during the day in order to keep our toddler and cat sane. And we like to add at least one sight-seeing stop along the way too. That way, Ava and I can chit chat about where we are going or where we just were. 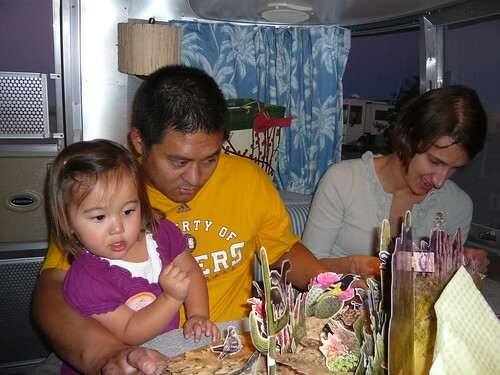 While we are sight-seeing, we place Yoda in the Airstream so she can refuel and potty. 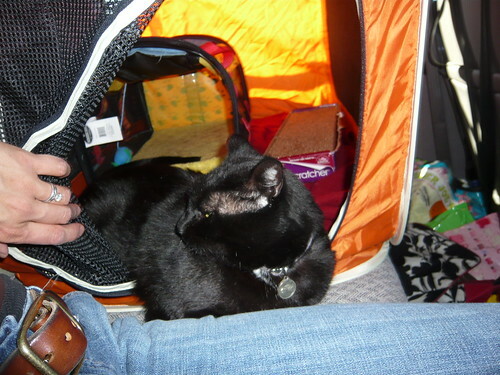 While driving to our destinations, Yoda sits in a large enclosure that holds a smaller carrier, a blankie and her favorite cat scratching pad. She does well in it for the most part. But if we keep her confined in there for more than two hours at a time, she starts to meow and tries to claw her way out of there. So that is another reason we like to take a lot of stretching breaks. 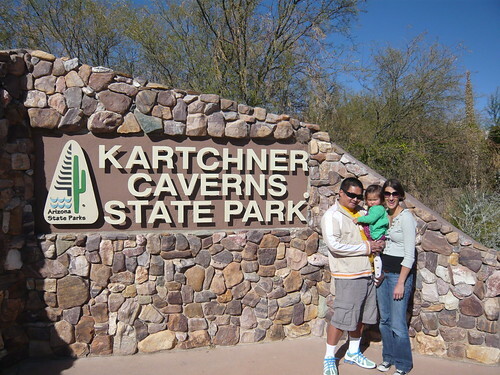 Our stop of the day was the Kartchner Caverns. None of us (including David and Carrie) have ever been there before so it was going to be an extra special treat for everyone. As soon as we paid for our tickets, they informed us that all of our belongings needed to be stored in a locker. Jackets, sippy cups, food, purses, scarfs, cameras, and even emergency diaper supplies. This was a huge surprise for us. We did some research online but didn’t notice any restrictions on the websites we visited. The tour of the cave we chose (the Rotunda Room) was going to be 1.5 hours long. With no extra diapers on hand (or water) I was a bit apprehensive but I am a rule follower so I followed the rules. No diapers. No exceptions. 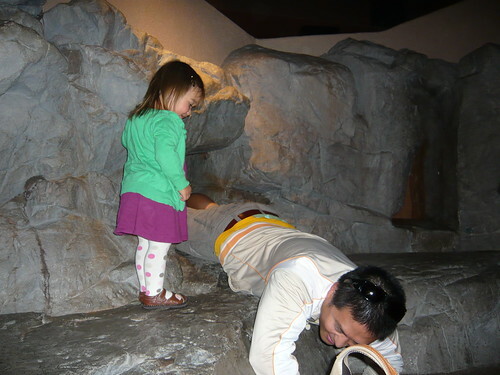 If they wanted to chance a leaky diaper in their cave, I could too. In summary, it was AMAZING! You have to go there if you are near Tucson. Seriously. The Rotunda room is open year around. The Big Room is only open during certain months of the year. They close it during bat migration season so the bats nor the babies that will be born there won’t be distributed by anyone… which makes the cave even more AMAZING. The respect they show the cave and its inhabitants leaves you with a good taste in your mouth. Sometimes things work out perfectly for both sides. Yeah. The cave is super humid and really sensitive due to its location. Thus, the rules for storing all of your “stuff” while on tour. As soon as we entered the cave through a series of protective steel doors, we got gently sprayed down with misters to keep the lint “on” our clothes. The temperature change is drastic and immediate. 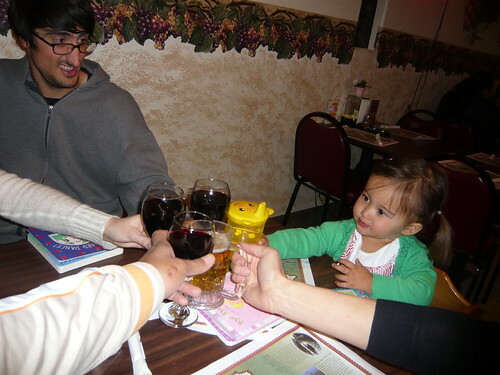 And in case you are wondering, Ava did well on the tour. As soon as we entered the cave, she kept repeating “it’s hot” and made the guide and the guests giggle. And when we entered the Rotunda Room, she immediately started to whisper. The entire time. She did perfectly. And didn’t have a leaky diaper neither. Thank goodness. 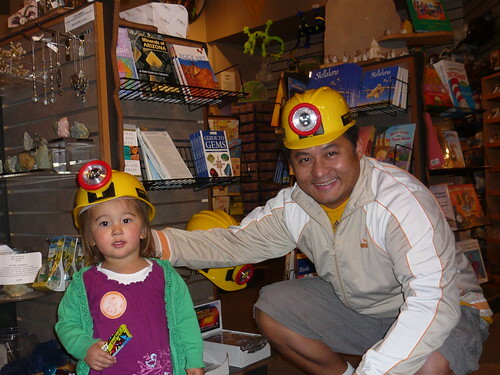 No pictures of the cave, obviously… but Ava did get to play in the little kids area of the Visitor’s Center. And she wasn’t the only one enjoying the little kid’s area. Hehe. 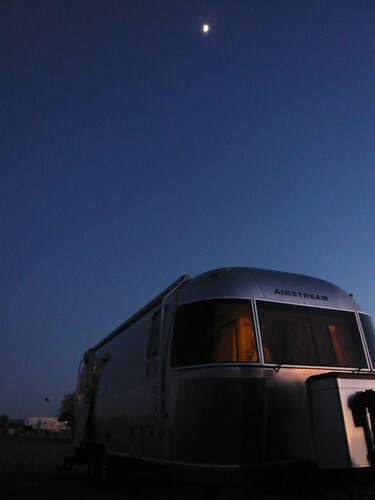 We decided to spend the night in Gila Bend, Arizona. 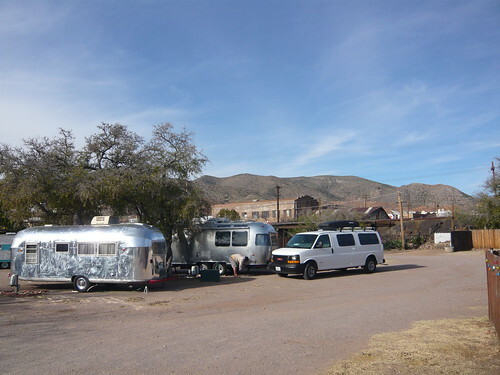 It’s a small small town but it was about 200 miles from Bisbee and had a few RV parks. 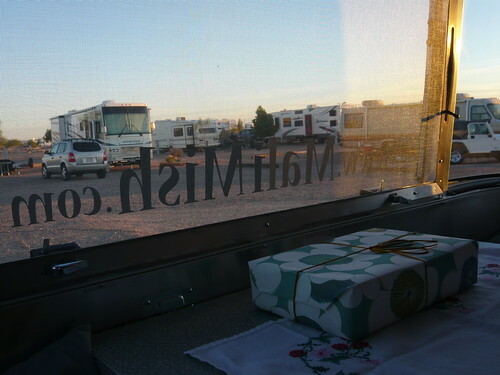 We decided on Augie’s Quail Trail RV Park for the night. And how couldn’t we. They claim to be “the friendliest folks around”. There were numerous snow birds there. Lots with huge rigs that made us pale in comparison. 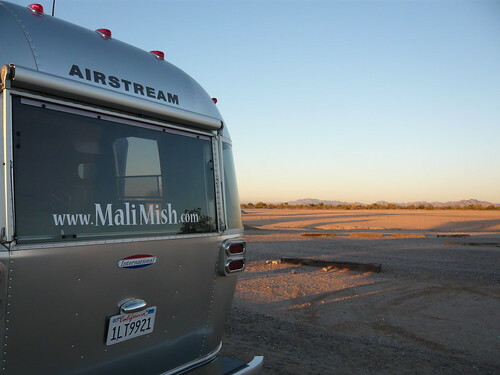 Augie was kind enough to park us at the edge of the RV Park in order to be closer to the restrooms, WI-FI and vast openness of his 44 acre parcel. The perfect backdrop for present opening. Yes! I got lots of cool gifts… with bird themes. I have a thing for birds, in case you didn’t know. And I got a slice of coconut pie too. Thanks David and Carrie! Dan and Ava got me this cool bird pop-up book that displays the different birdscapes of our country. And low and behold, the very first one in the book is of the Sonoran Desert. What a coincidence! 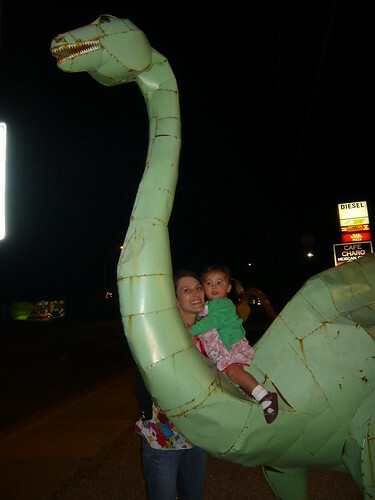 After settling in, we hit the town gas station to get our fill of cheap diesel, mint chip Thrifty ice cream and dinosaur rides. And then we were off to get at bite to eat at Little Italy to enjoy some authentic Italian food and to celebrate MY BIRTHDAY!!! Cheers! The Town Too Tough to Die.